Part of the pros and cons of cloud computing list is cost savings. Cloud computing is economical since it allows you to get the value of your money with its flexibility in price and resources. How is this possible? Cloud computing is offered in its lowest rates possible because the services are shared. Also, cloud computing provides resources on-demand. You get to pay what you used. So, if you are just beginning in the E-commerce industry, your need for resources is usually within the minimum. You will only pay for more resources if there are spikes of demand, or if your business begins to grow and reach more people online. This provides the opportunity for small and medium businesses to avail quality service within the budget that they have. Altogether, cloud computing is the most practical service as it can cut cost in server storage, management, infrastructure, administration and operation. 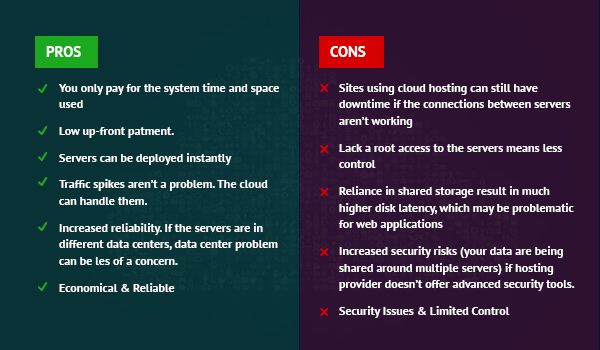 Also part of the list of the pros and cons of cloud computing is reliability. Despite the sharing of resources, there won’t be difficulties with the availability of services from cloud computing because it can easily upgrade the resources provided to its clients. If one server can no longer provide the demand for computing resources, others from remote areas serve as reinforcement. Thus, you get a stable service with 99.99% uptime for a cheap price, without the effects of other website’s performance. Also, cloud computing reliability is observed on its secured data storage. Several copies of the data are made as a backup, so that in case of data loss, they can easily be retrieved. This advantage of cloud computing is possible with the numerous remote servers that consist of the cloud computing network. Each one serves as a backup of the others, and ensure the accessibility of your data and the service they provide as long as you have the Internet. Part of the list of pros and cons of cloud computing is security, which has been a long-debated issue. It has been part of the list of the pros and cons of cloud computing, without a clear stand whether it is advantageous or not. Using the Internet, cloud computing can constantly update its software, patches, and applications to ensure that it is secured and that it is capable of defending the data it stores online against malicious attacks. At the same time, uploading important business data into the Internet becomes a source of hesitation among small and medium businesses because it can open the possibility, no matter how minute, that their business data can be breached. This risk has been haunting cloud computing since there is no perfect system. Hackers can exploit vulnerabilities, yes, but the possibility of this compromise is really small. Lastly, limited control became a part of the list of pros and cons of cloud computing because of the IT management that cloud computing provides. The place of control in the list of pros and cons of cloud computing can change depending on your need. If you are not tech-savvy and you prefer the convenience of setup and configuration headed by your team of experts in cloud computing, the kind of control it provides is surely an advantage for you. That would be one less thing to worry about. But businesses also have branding and some would prefer customizing their services. Some would prefer a different setup because they find it more effective. This kind of perspective demands great knowledge on the part of the entrepreneur, not only of the pros and cons of cloud computing but also of setting up an online business without help from an expert. Assuming that your business brand matters so much, yet you don’t have the time to educate yourself beyond the pros and cons of cloud computing, you can always tap a team of expert to manage all the technicalities for you. It is easy to see that the pros and cons of cloud computing depend on your capacity for IT management or your capacity to pay for the services which may include IT management and cloud computing itself. What is clear is that cloud computing can provide quality service that will suit your business needs.